Functions in C++ language are building blocks of a C++ program. 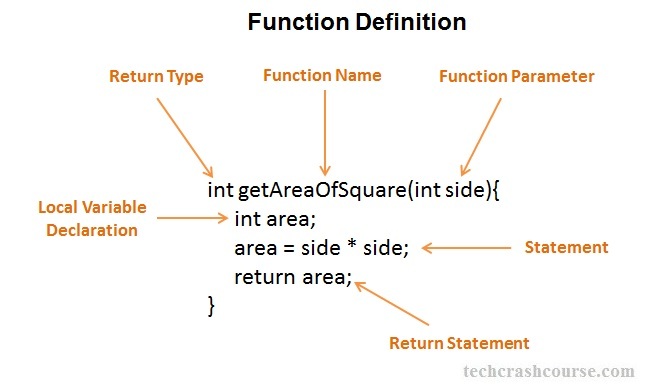 A function is a sequence of statements to perform a specific task and it can be called by other functions. A function may take some input and perform a logical unit of task and may return the response to calling function. The function in C++ language is also known as subroutine, procedure or method. A C++ program is a set of functions calling each other. We can use any number of functions in a C++ program. All C++ programs must contains at least one main() function. When a function exits, it return control to the calling function from where it is called. There are two types of functions depending on whether a function is created by programmer or is pre-defined in library. We can call a function any number of times in a program from any place which avoid rewriting same code again and again at various program. A large C++ program can divide into set of functions, where each function owns the responsibility of performing one specific task. Functions are written in order to make C++ program modular. We can add common utility functions in header files, So that It can be reused by other programs. Breaking a large C++ program into functions, makes it easy to maintain, more readable and easy to understand. First of all main() function of C++ program gets called by Operating system. Execution of C++ program begins. Program's statements and expressions getting executed in top to bottom sequence. When control reaches a function call lets say myFunction(int val); it pauses the execution of current function and control goes inside the called function myFunction. Once execution of code inside myFunction body finishes control comes back to the calling function. It resumes the execution of calling function at the next statement following the function call of myFunction. At the point of any function call, control keeps on jumping between calling function and called function. C program terminates when execution of main function ends. A function declaration in C++ tells the compiler about function name, function parameters and return value of a function. The actual body of the function can be defined separately. Like variable in C, we have to declare functions before their first use in program. Function declaration in C++ always ends with a semicolon. Declaration of a function with multiple input parameter and integer return type. Declaration of a function with no input parameters and integer return type. In above program, we declared a function named "getSum" before main, which takes two integer parameters. After main, we defined the function to add two numbers and return sum. A function definition in C++ language consists of function name, function parameters, return value and function's body. return_type : The return_type is the data type of the value returned by the function. void data type is used when the function does not return any value. By default the return type of a function is integer(int). function_name : This is a C++ identifies representing the name of the function. Every function must have a unique name in a C++ program. Name of a function is used to call a function. type arg1, type arg2 ..... : It is a comma-separated list of data types and names of parameters passed by the calling function. The parameter list contains data type, order, and number of the parameters expected by a function at the time of calling it. Parameters field is optional, we can skip it if a function don't require any data from calling function. body of a function : The body of a function contains a set of statements that will be executed when this function is called. It may define it's own local variables and call other functions. return(expression) : This is used to send a value to calling function before termination of function. If the return type of function is void, you need not use this line. When control reaches return statement, it halts the execution of function immediately and returns the value of expression to calling function. First line is called as Function Header and it should be identical to function Declaration/Prototype except semicolon. Function's definition contains code to be executed when this function is called. Name of arguments are compulsory here unlike function declaration.